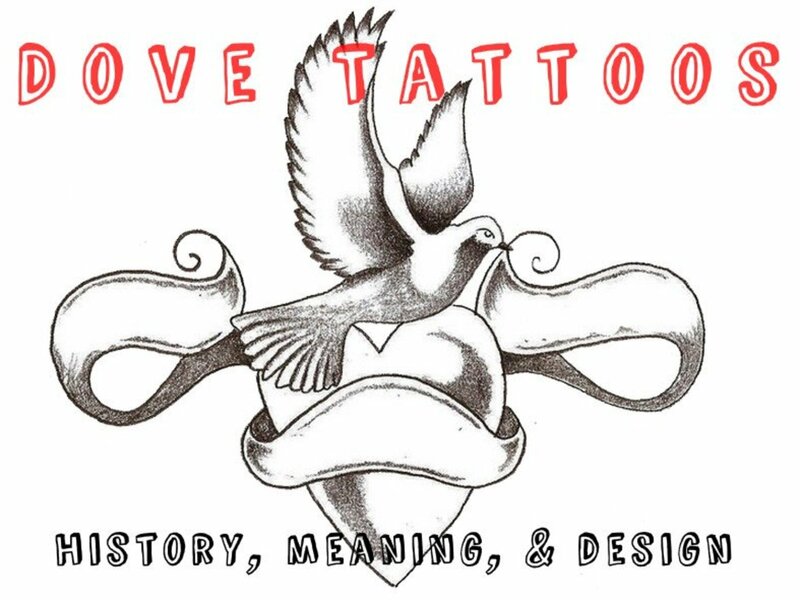 The eagle is highly symbolic across a number of cultures, and consequently is an excellent choice when considering a tattoo theme or design. In America, eagles are a symbol of patriotism, and are sometimes designed with the colors of the American flag to reflect that meaning. For many Christians, the eagle is embraced for its keen sight, which is symbolic of seeing things clearly from a spiritual perspective. It's also a nod towards the eagle flying high and taking in the entire scene, suggesting seeing things from God's perspective. Outdoorsmen respect the eagle for its ability to see its prey from afar and its rapid attack. 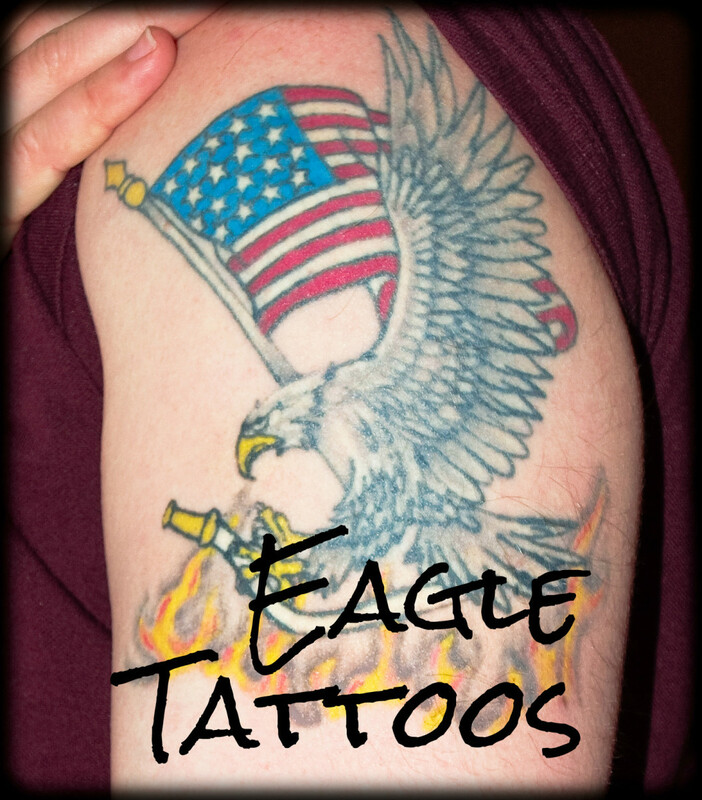 All of these make the eagle a desirable choice for a tattoo design. Popular design choices include a flying eagle with its wings outspread or the white majestic head of the bald eagle. 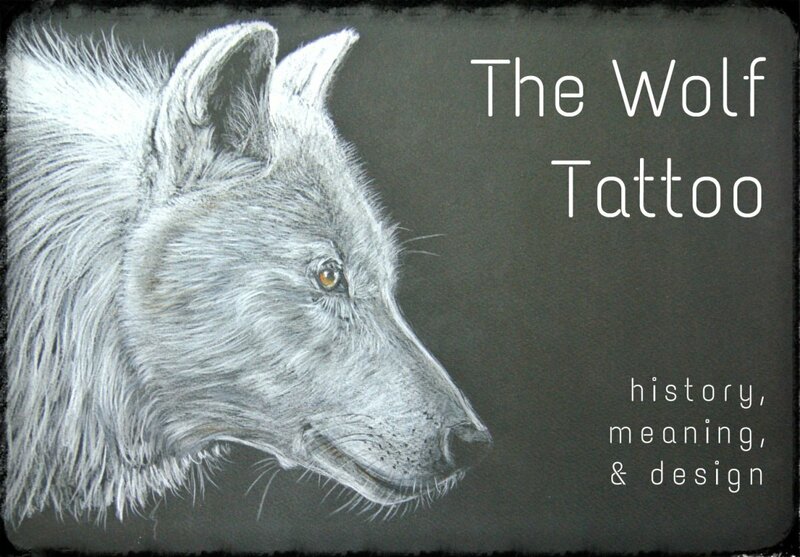 While Americans relate strongly to the eagle, other cultures do as well, which generates an interest in tribal eagle tattoos of a Celtic, Aztec, or Slavic variety. Some of the branches of the American armed forces also adapt the eagle as a symbol, connecting it to their specific branch by including something unique to them, e.g. 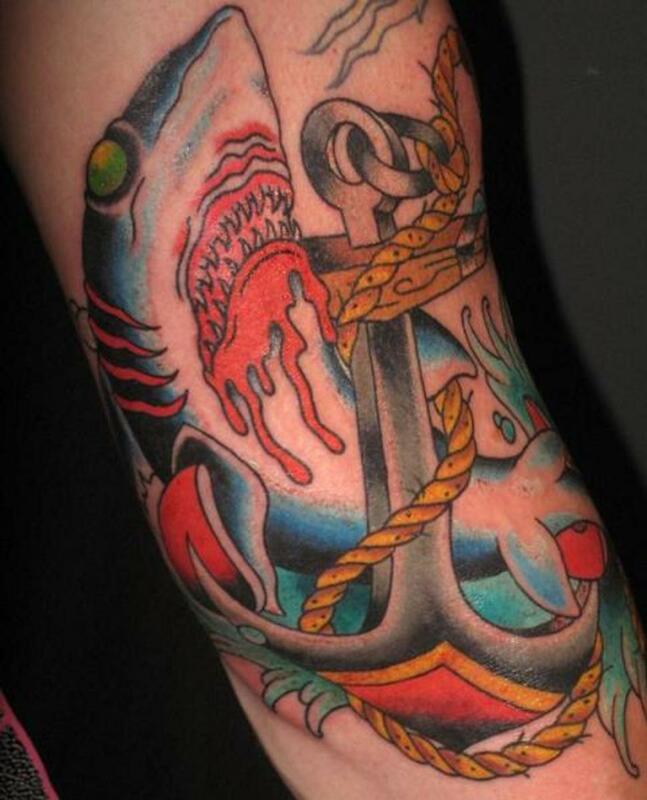 an anchor for the Navy, or other such themes blended together in one design. The particular physical characteristics of the eagle make great material for a tattoo artist and the recipient of the ink, including its magnificent beak, wing span, eyes and talons. In some cases, of which I'll show you a couple, the talons are used to create the effect of ripped skin, which really works well with this majestic bird. 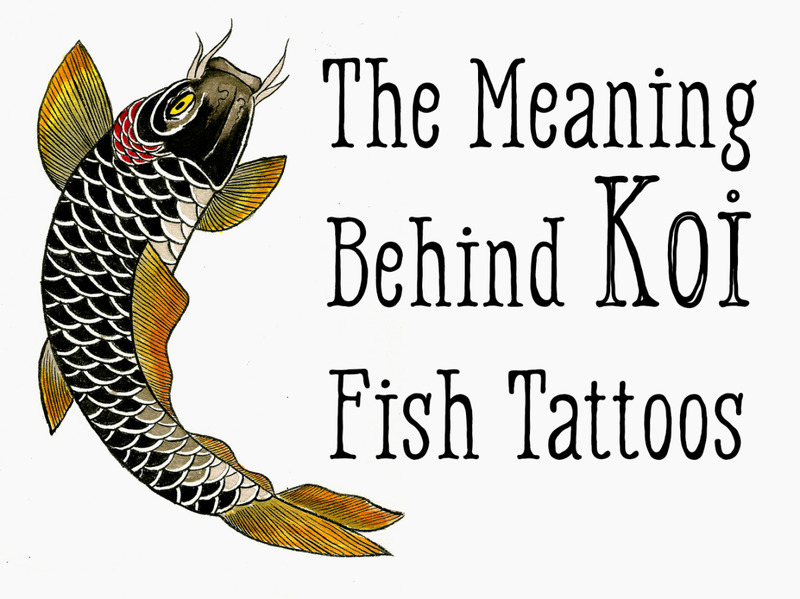 You've probably seen that amazing image of an eagle flying in over water to grab hold of a fish with its powerful talons, and with this first tattoo we look at this fierce predator about to do just that. 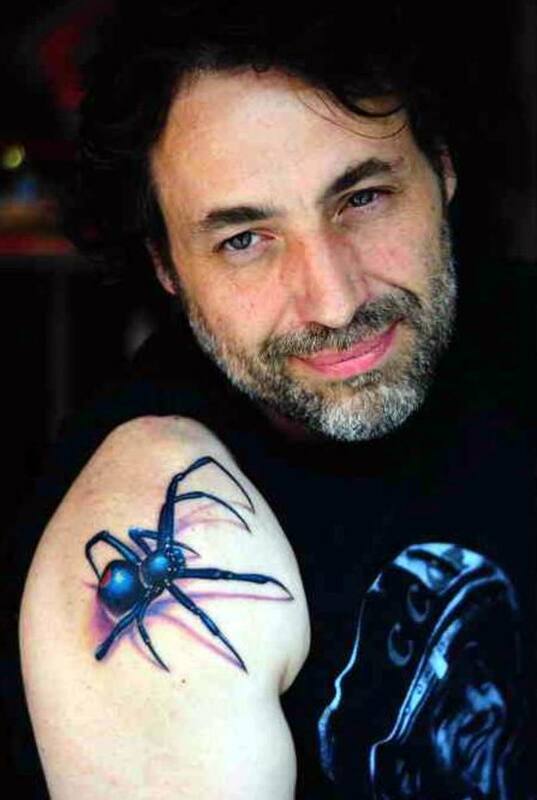 I like how the moment is captured permanently on the skin. The feathers look great on the wings, as do its focused eyes which don't leave its victim. Here is another must-see design of a magnificent eagle head; specifically the head of the bald eagle, which captures our imagination and speaks volumes to the majesty of the bird. The actual head is done well, and I like every aspect of it. My only complaint is the bottom, which makes it too discontinuous. It would have been better if there had been a gradation down the neck, rather than such an abrupt stoppage, which gives it an unnatural feel. 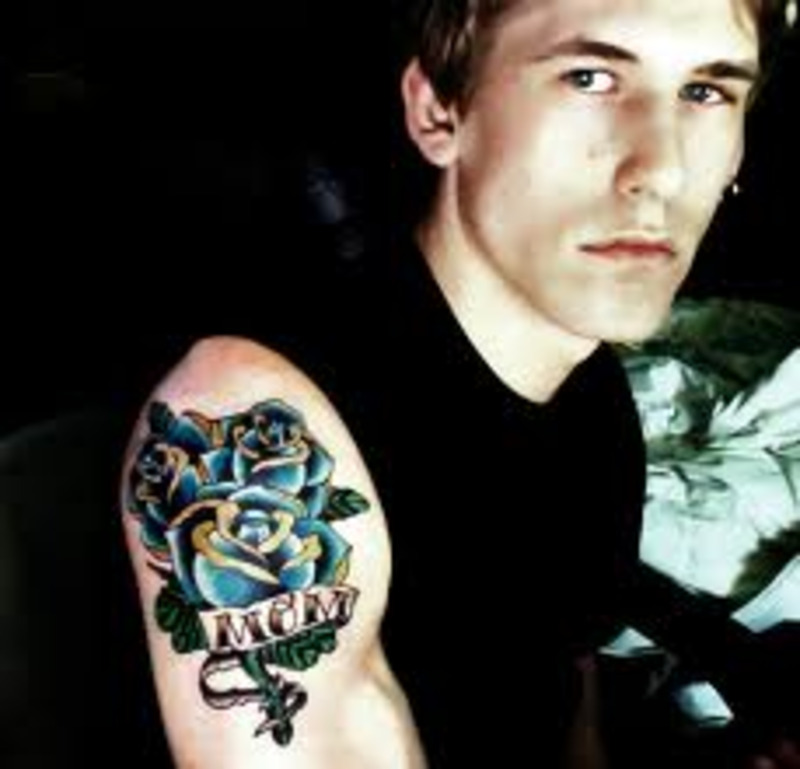 Still a great tattoo. With this eagle head, we get a look at what I was mentioning at the end of the last description. Note how the bird's neck feathers cover up the discontinuity from the end of its neck. In my opinion, this is an improvement over just a straight light. The beak here is also done very well, and the eyes look like they're frowning, or enormously focused, as it has apparently spied something it wants to get its talons into. That reddish tint adds an ominous feel. 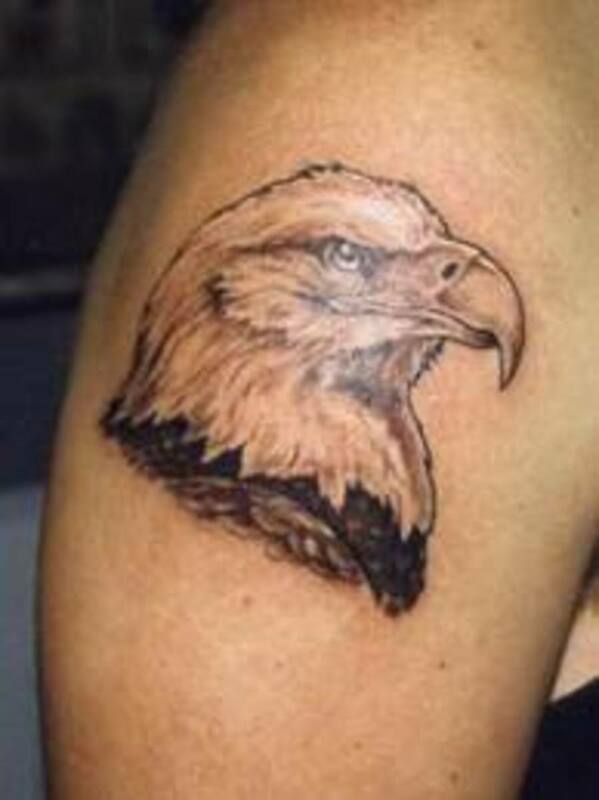 Eagle head tattoo on shoulder. 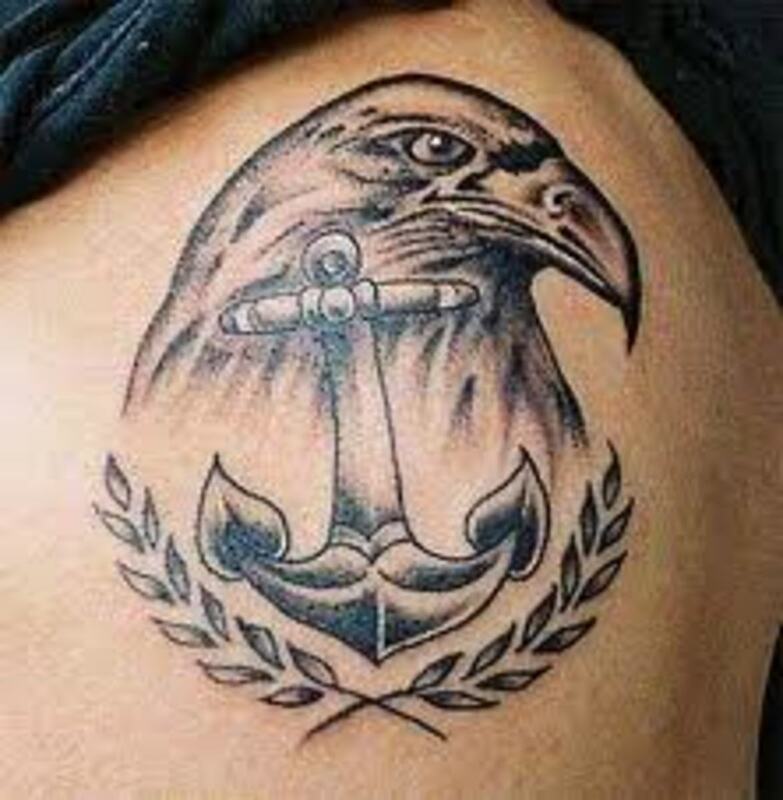 Here we have an example of combined themes, with the eagle head and an anchor, signifying the navy. For those readers who are Americans, there is little in the need of explanation as to what this means, as the American eagle is considered a sign of patriotism. 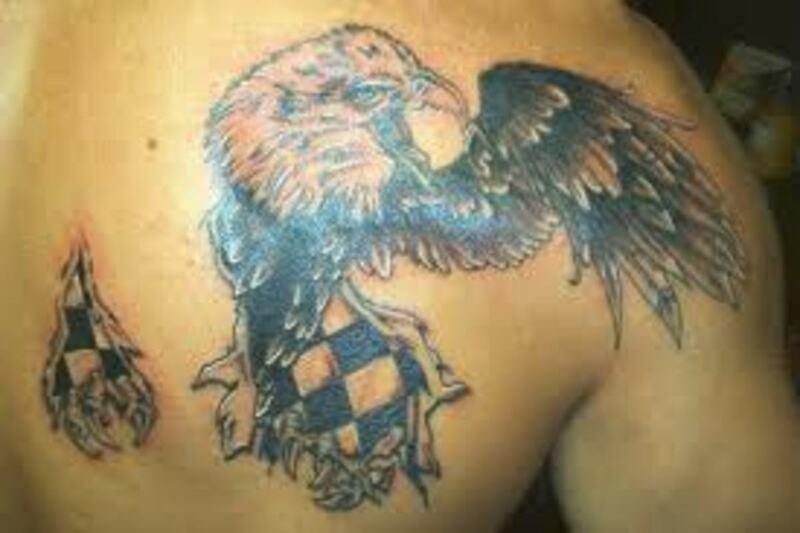 The characteristics of the eagle lend themselves easily to some tribal designs, as you can see below. 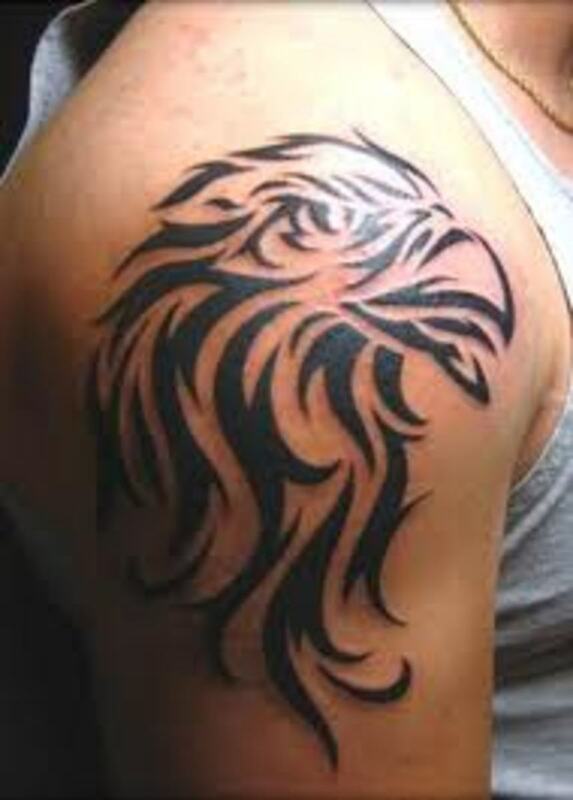 This is just the right way to create a tribal eagle head, with the lines representing the eagle nicely. 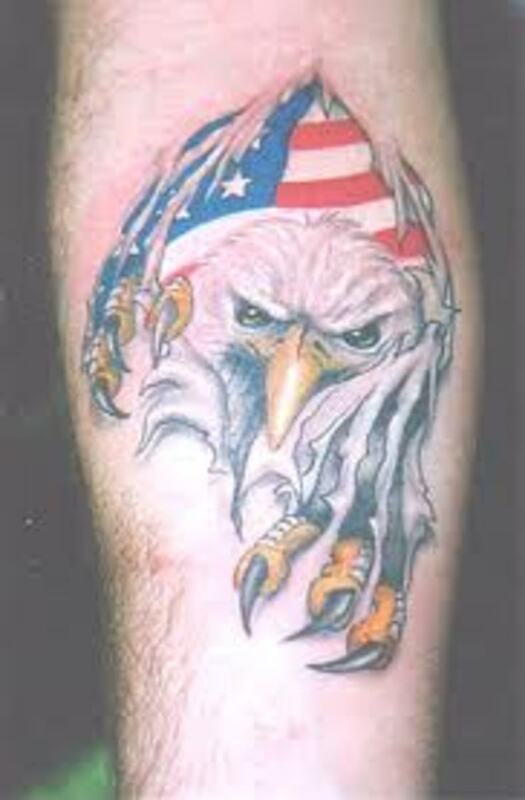 The talons of an eagle are a distinct element of this bird which can be incorporated into a tattoo. Most obvious of these is to use the talons to create an awesome ripped-flesh look. With this tattoo we see the over-sized talons appearing to rip through the back with the head of the eagle about to come through the opening. That, along with the backdrop of the American flag, makes for a fantastic choice. 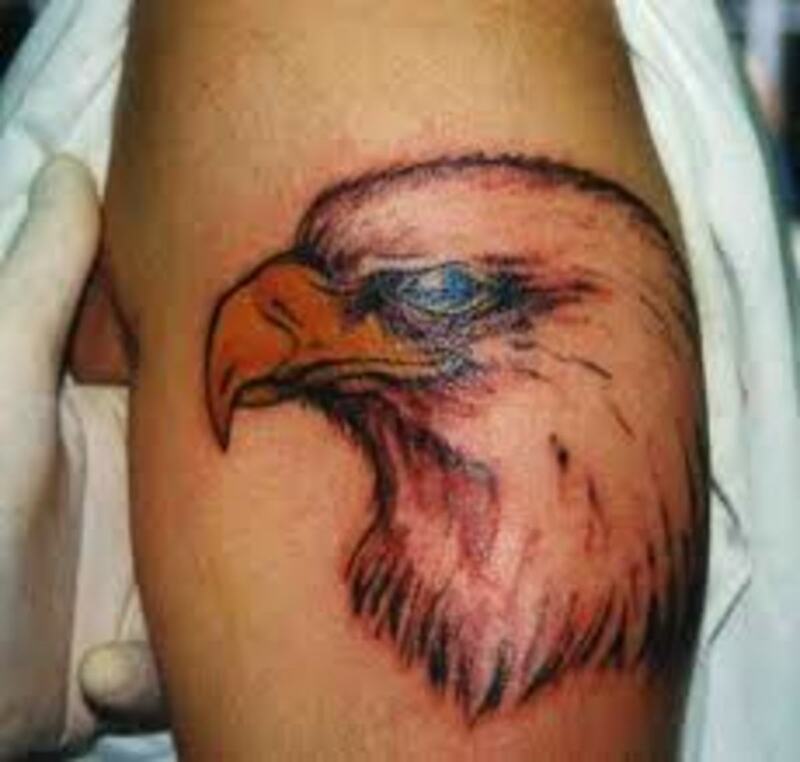 With this design of an eagle breaking through the skin, we get a much different look than in the one above. The strengths of the design are the head and wings, which look to be taking flight. The weakness is the talons, as they aren't nearly as compelling as the talons above. Here you really don't notice them, as they're smaller and understated. The checkerboard pattern behind the eagle is also a bit confusing. 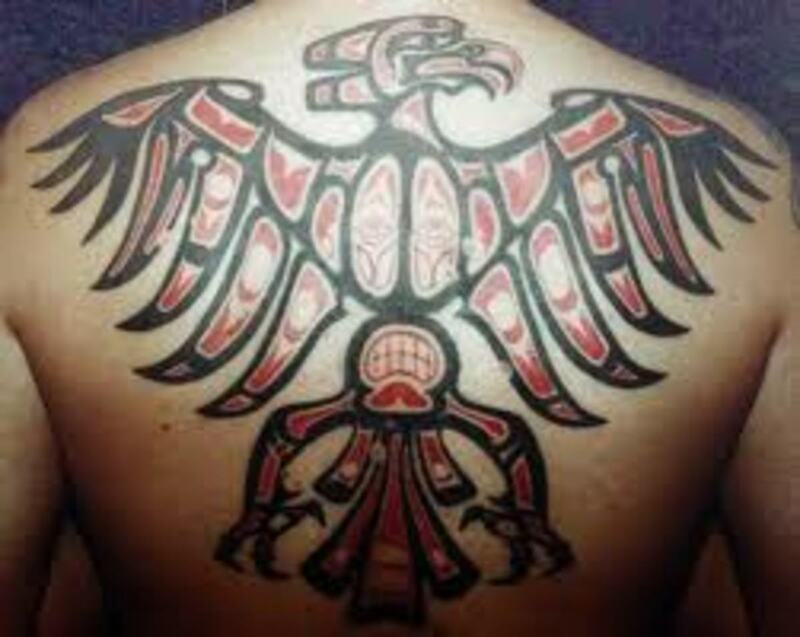 The wide wingspan of this tribal eagle makes the back a perfect canvas for the design. 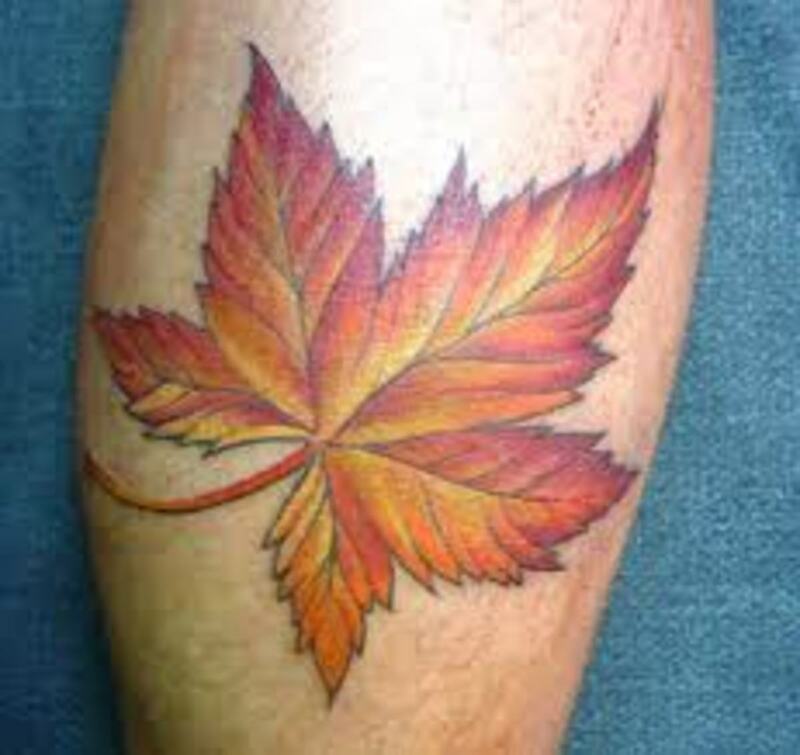 The color, lines, and shapes make this a great tattoo. Those red, black, and white colors are very bold and compelling, and the talons look fearsome. The black color at the end of each wing and feather is another nice touch. This is yet another great-looking tribal eagle, though this time we are looking at one in an Aztec style. 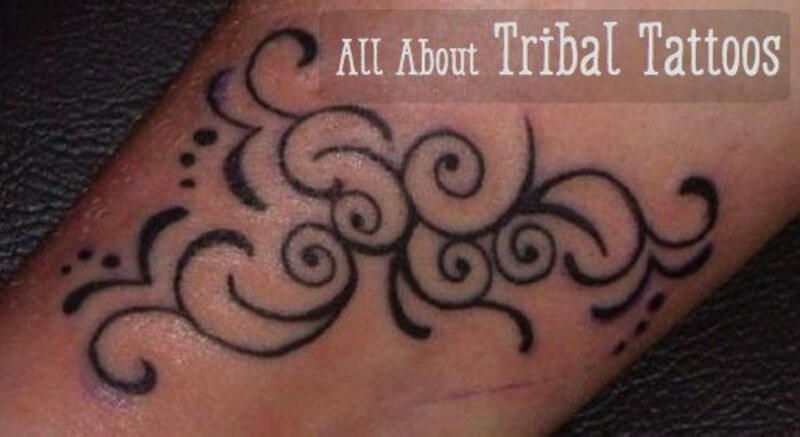 What is fantastic about tribal designs is their striking simplicity and boldness. Now we go to a totally different cultural look, Celtic art. If you've seen other Celtic art, you'll recognize the overlapping, curvy lines. While the outer part of the eagle retains most of its usual look, the inner design sets itself apart from the others. 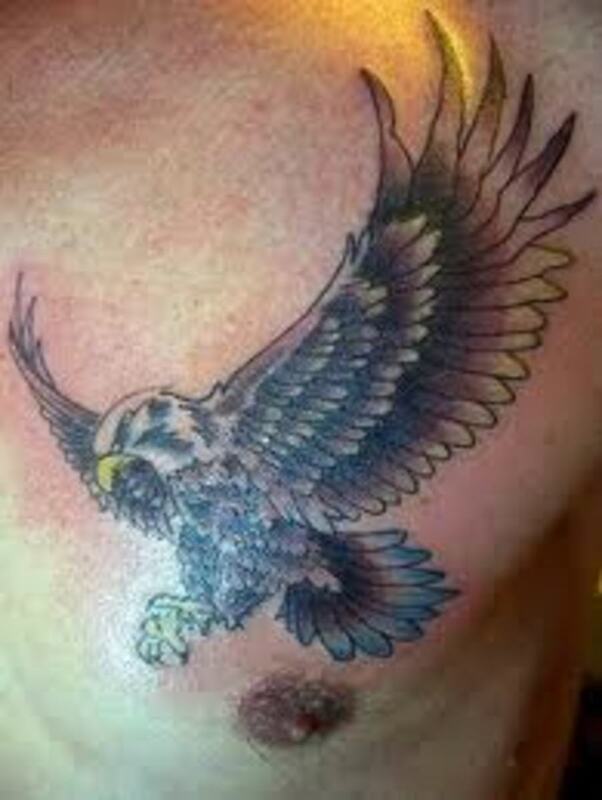 We'll finish off this look at eagles with this tattoo of the bird soaring in the air. This is what it's all about. These majestic design possibilities are what make them such desirable subject matters for artists. 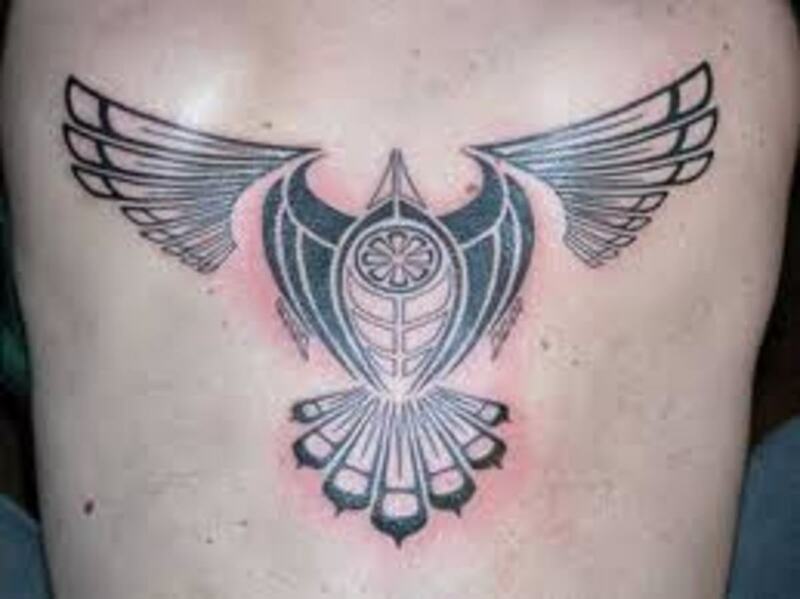 The black in the middle of the body of the eagle is really nice, and that reddish tint in the wings completes the amazing look of the tattoo spread across his back. 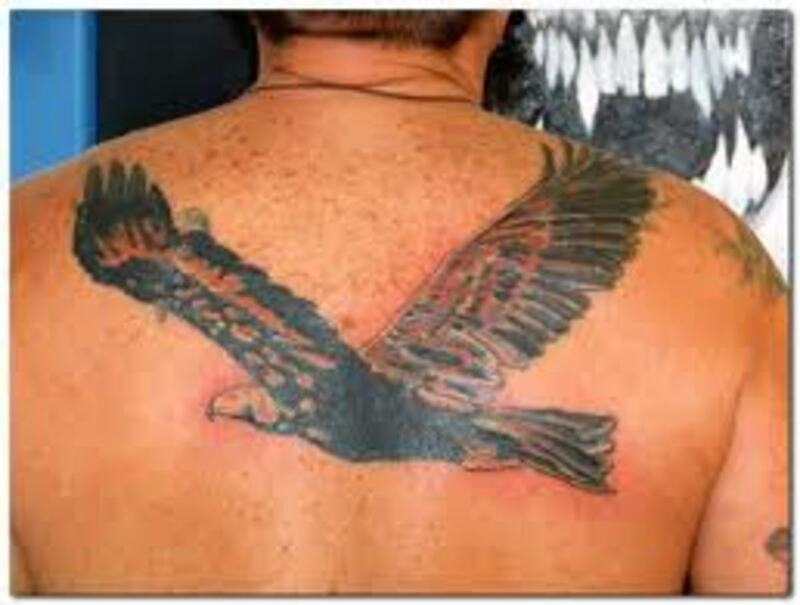 Now you can see why the eagle is such a popular choice for those seeking an awesome work of art on their bodies. Even with this many designs to look at, we've barely scratched the surface of the choices out there for those seeking the eagle as their tattoo of choice.